Stories of Palestinian women’s lives and their experiences since 1947-8: stories of dispossession and refuge, loss and injury, love and courage. 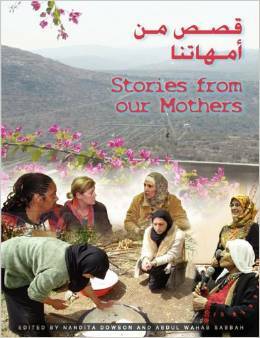 Stories from our Mothers (meetings of Palestinian and British women) is a book in English and Arabic of personal stories in their own words telling of Palestinian women’s lives and their experiences since 1947-8: stories of dispossession and refuge, loss and injury, love and courage. The book is also testimony to the power of exchange visits through which British women discover the human rights situation of their counterparts in Palestine. It gives great encouragement to the movement of grassroots twinning with Palestine.